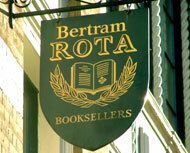 From our early days we have established a leading reputation as a dealer in private press books. Our first catalogue, entirely devoted to The Art of the Printer, appeared in 1949 and contained 850 books. Today, our stock ranges from the press-work of the 1880s to creations by contemporary artists and printers. As well as works from the major houses such as The Golden Cockerel, Kelmscott, Nonesuch and Eragny Presses, and Officina Bodoni, we deal in works by contemporary British printers such as Parvenu Press and Whittington Press. We also are proud to offer productions from presses of international renown such as Barbarian Press in Canada, and The Perishable Press in the United States. We offer an extensive selection of titles concerning typography, bookbinding, and other areas of bibliographic interest. The visitor to our shop is sure to find our shelves well-stocked with old favourites and unusual novelties. Enquiries from collectors seeking specific rarities are always welcome.